It is, of course, a generalization to say that Alsace wines are the worlds' most age-worthy wines. Indeed, there are German Rieslings, Sauternes, Champagnes and Chenin Blanc from the Loire that easily improve for 50 years or more. But the uniqueness of Alsace is that quite "simple" - and affordable - wines can have an almost eternal life, provided that the yields are kept low and the acidity is in place. 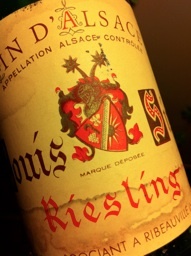 1971 Riesling Réserve Exceptionnell by Louis Sipp in Ribeauvillé origins from lieu-dit Steinacker. The color is brilliant and golden. On the nose, it is compact, with wet wool, lots of citrus, chocolate, nuts and lots of other komponenenter. The taste is absolutely vital, focused and completely dry with stunning acids that highlights layers of fresh fruit and a long, long finish. Incredibly good! Price: € 11 (current vintage).